I have a close friend of mine who is hurting. Really hurting. In fact, I seem to have several friends that are struggling on different levels. Some are struggling physically with an ailment or a disease. Many are struggling financially. Most are struggling emotionally. When times are hard, people are hurting. When I think about someone who understands how painful life can be, I think of the biblical character named Job. 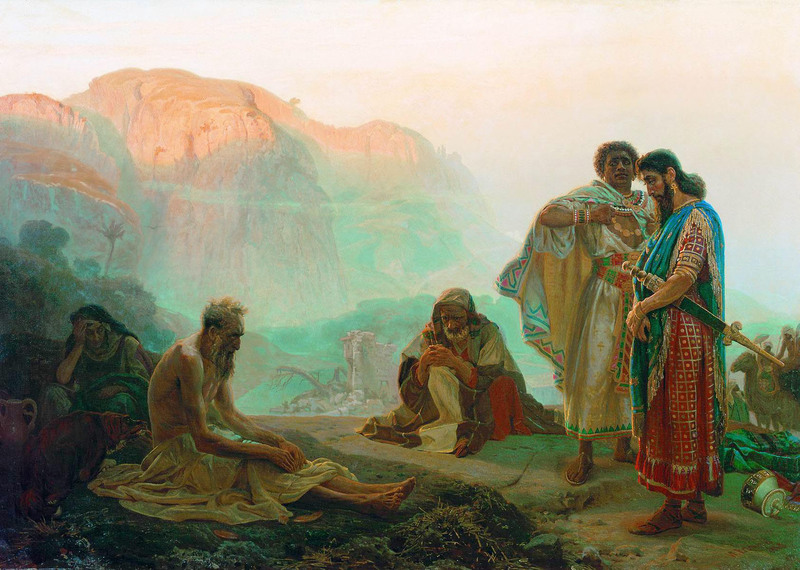 In the book that bears his name, we are told that Job was the “greatest of all the men of the east.” He is married with ten children, extremely wealthy and described as “blameless, upright, fearing God and turning away from evil.” By all accounts, Job is a good man living a blessed life. That is, until the sixth verse of chapter one when everything changes. Job went from being the greatest man in all the east to being the most miserable – in less than an hour. On our worst day, none of us have ever had to endure such tragedy and pain. Even Job’s wife encouraged him to “curse God and die.” Nice comforting words from someone who is supposed to be your closest earthly friend. Job is now alone. All his children are dead. All their homes are destroyed. All his livestock (and therefore his business) are gone. He no longer has the support of his wife. As a sign of mourning, he tore his robe, shaved his head and is now sitting in a pile of ashes. And if that is not enough – he is in excruciating pain trying to deal with bloody, open wounds on his entire body. Imagine the physical and emotional pain. Imagine the loss! Job is unaware that all of this is occurring because of an invisible divine dialogue. All Job knows is he is hurting and struggling for hope. Even in the midst of this, Job does not lose his faith in God. Enter Job’s three friends; Eliphaz, Bildad & Zophar. What these three men do is leave an example for us of what to do (chapter 2) and what not to do (chapters 4 to 37) when someone is hurting. The passage is in italics. The lessons are in bold. Lesson #1: The friends went to Job as soon as they heard he was hurting. Do you do that? Job’s friends did not wait for Job to be in a position to call for help. Oftentimes, the people who are hurting can’t reach out for help. The pain is too deep and the wounds are too sensitive. They need for us to come to them. Job’s friends went to Job. Are you THAT kind of friend? Lesson #2: Their initial goal was sympathy and comfort, not advice. Job did not need advice. He did not need a sermon. He did not need anyone to tell him why they thought God was allowing this. He simply needed someone to be with him during his darkest hour offering silent support. When his friends opened their mouth (chapters 4 to 37), Job lost his comfort and wavered in his faith. Lesson #3: Job’s friends did not lose their kids. His friends did not lose their jobs. They were not in physical torment. And yet, they joined Job in his suffering and communicated their solidarity with him. If Job’s heart was breaking, so was theirs. How well do you identify with the suffering of your friends – even if you have never experienced what they are going through? Romans 12:15 says to “rejoice with those who rejoice and weep with those who weep.” The goal is to be compassionate and empathetic, regardless of someone’s situation. Are you THAT kind of friend? Lesson #4: Job’s friends got on Job’s level and stayed with him for as long as they could. The lesson is not where we physically sit. The lesson is not staying for a week after each tragedy. The principle is getting on the same level as your hurting friend and seeing them through the pain completely. Throughout the Bible, the number seven is a number of completion. It’s not the seven days that is important, it’s the fact that Job’s friends were communicating – “We are here for the long haul, Job. We are here for you – regardless of how long this takes.” Anyone can offer initial support. Anyone can send a card or give a few bucks to assist. But are you the “I will sit with you until your pain is relieved” type of friend? When lives fall apart, it can get real messy. It’s not easy loving a hurting friend. Are you THAT kind of friend?